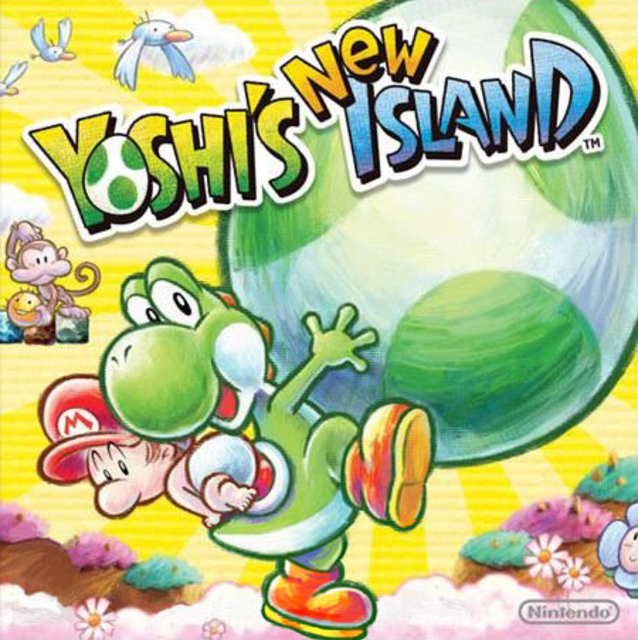 Because Friday (3/14/14) was the release date for "Yoshi's New Island" on Nintendo 3DS and today is Saint Patrick's Day (calling for greeeen!) 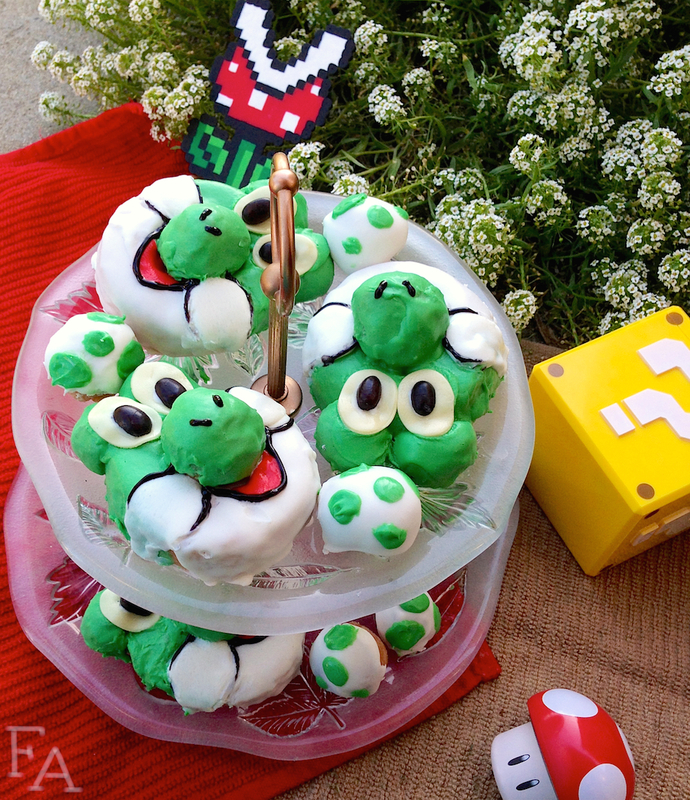 I decided to make something little dinosaur Yoshi related! These yummy treats are created in the style of Japan's doubutsu doonatsu, or animal doughnuts (check out the Kuroneko and Jiji ones I made previously). For more info on this doughnut dessert style, click here. Note: There are a couple of ways you can go about this dessert; you can use frosting OR candy melts/chocolate to cover the doughnuts. I used frosting, but candy melts and/or chocolate would give a smoother finish and solidify better. Next time I do a two-tone/more complex doubutsu doonatsu like this, I'm definitely using melts or chocolate (so that's what I suggest for you!) though frosting does make this dessert more cake-like. 1. Line 2 trays with foil & then place a wire rack on top of each (or simply place your racks over large pieces of foil). Lay the doughnuts on one of the racks along with 1 whole doughnut hole & 1 cut-in-half doughnut hole for each doughnut (see photo). Place the rest of the doughnut holes on the other rack. Heat the green candy melts or frosting in the microwave (15-20 seconds for the frosting & 30 second intervals for the melts) & then stir until it's nice & smooth. 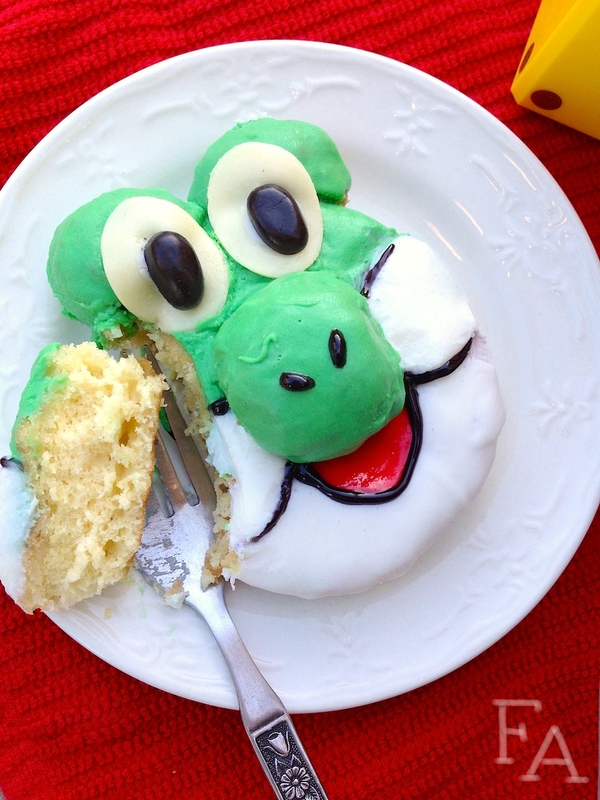 Dip the cut sides of the half doughnut holes in a little of the candy melts or frosting & stick them to the top edges of the doughnuts for Yoshi's eyes. Spoon the green melts/frosting onto the top half of each doughnut, also covering the doughnut hole eye-bumps. Spoon green over the whole doughnut holes--the ones paired with the doughnuts, not the ones on the separate rack--as well. Let cool for a few minutes (if you used up all of your green, scoop up the green that has dripped off the doughnuts onto the foil below & put it back in your bowl/container to use later). 2. Next, melt the white chocolate/candy melts or frosting the same way you melted the green. Spoon white onto the bottom half of the doughnuts, spooning a little extra in the cheek areas, making sure the cheeks are round! 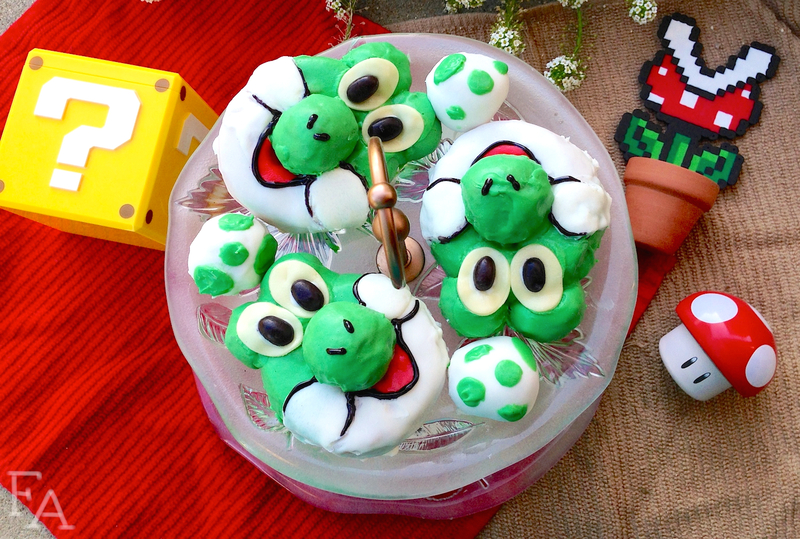 Using two toothpicks, or very carefully using your fingers, place 1 completely green doughnut hole on to the top of each green & white coated doughnut (on the hole area of the doughnuts) to form Yoshi's nose. Cover the doughnut holes on the rack of their own completely in white (to make the base for the Yoshi eggs). Let them cool a little. Zap your bowl/container of green melts/frosting again if it needs to soften up & then carefully spoon on, or use a toothpick, to create spots on the white coated doughnut holes. Let cool. 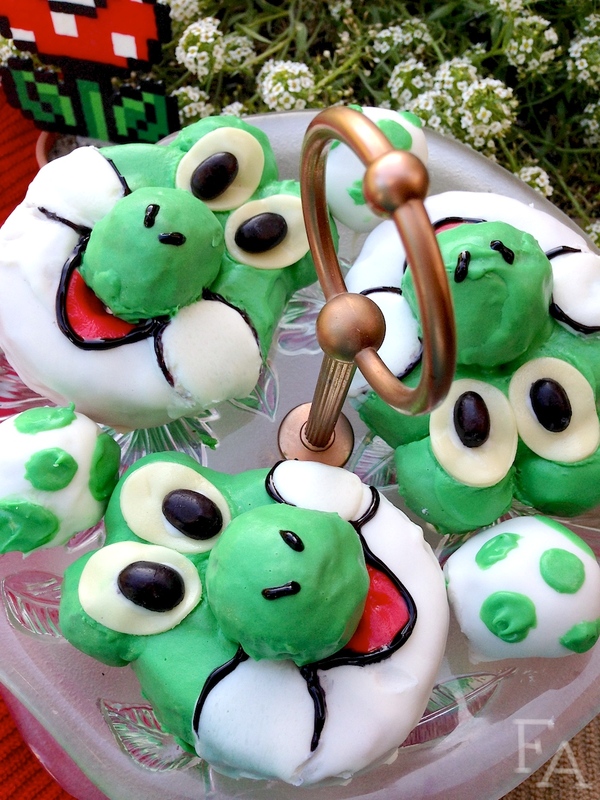 The Yoshi eggs are now done! 3. Using your clean fingers, soften & flatten several vanilla tootsie rolls & place on a flat work surface (don't make them too thin or the green frosting will show through once placed on the doughnut!). Cut several circles from the vanilla, 2 for each doughnut, & then gently pull/shape each circle into an oval. These are Yoshi's eye whites. Carefully place the ovals onto the doughnuts, close together, above the nose, about 1/4" in from the top edge of the green eye-bumps (see photos). Soften & flatten 1 or 2 red candies & then cut half circles, 1 for each doughnut. Gently stretch/shape so that they become slightly triangular. Carefully place 1 red shape onto each doughnut, directly under the nose. 4. Carefully cut 1 black jelly bean in half, length-wise, for each doughnut. Using white cookie icing, white frosting, or white chocolate, dab a small amount onto the cut side of each jelly bean half & affix the beans onto the eye-whites, a little closer to the bottom edge than the top (see photos). Next, make nose slits & cheek & mouth outlines using the black decorating gel (you can leave off the cheek outlines if you want). Serve the same day (doughnuts tend to dry out by the next day & flattened tootsie rolls will dissolve on the doughnuts if stored in an airtight container so...just eat them up quick! If you use candy melts though, even to make the eye-whites, they might last a little bit longer). Super cute! Your blog is right up my alley! Glad you tweeted my Animal cupcakes :) I found you! Thanks! I love your blog too--so many fun ideas!